The LiteBeam ac (LBE-5AC-23) is an ultra-lightweight 2x2MIMO airMAX ac CPE device with incredible range and disruptive pricing. 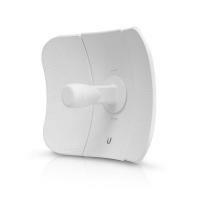 LiteBeam is the latest evolution of a lightweight and compact outdoor wireless broadband CPE from Ubiquiti Networks. The LBE-5AC-23 was designed to be an affordable cost/performance solution for long-distance, wireless broadband bridging. It operates in the worldwide, license free 5 GHz frequency range and features high performance of up to 450 Mbps in real outdoor throughput and an incredible range of up to 30+ km. Its InnerFeed technology integrates the entire radio system into the feedhorn of the antenna, and our revolutionary airMAX TDMA protocol enhances network performance and scalability. The LBE-M5-23 also features a unique ball joint mounting system that provides 3-axis adjustment flexibility for versatile mounting options. The mounting system, coupled with the built-in bubble level, enables quick and easy alignment. A lightweight form factor contained within ultra-compact packaging.